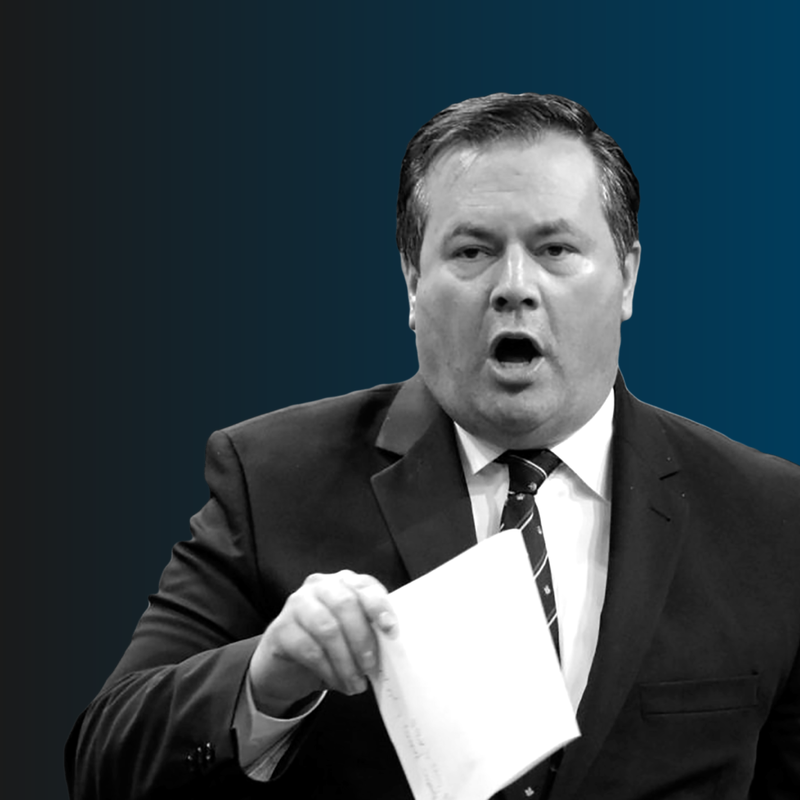 Jason Kenney doesn't want to talk about health care. On the campaign trail, he certainly isn't using a megaphone to broadcast his plan. Little wonder. His platform is full of doublespeak and bafflegab that shows he wants to cut public health care and implement American-style care in its place. Like most of Kenney's ideas, it doesn't stand up to closer inspection. Take Kenney's guarantees to "maintain or increase" health care spending. It's a promise as flimsy as the novelty Coroplast pledge he signed before the campaign kicked off. Kenney's official platform is actually a "streak of zero increases," notes long-time health reporter Keith Gerein. Given a growing and aging population, the zeroes are actually cuts draped in a poorly-tied hospital gown. When asked about two-tiered care, Kenney relies on talking points about obeying the Canada Health Act. Kenney's essentially promising he won't break the law, without saying he won't break public health care. "If you find that kind of vague, non-specific response frustrating, you're not alone," Gerein argues. "Albertans are right to suspect the UCP is willing to explore the private-pay pathway for health care." Don Braid from the Calgary Herald is equally concerned about Kenney's assurances that he will magically find money in the provincial couch cushions. As Braid notes, Alberta already has the lowest health administration costs in Canada. "Kenney could fire every single executive, manager, planner and co-ordinator and eliminate the whole network fo central services - and still only save enough to keep front-line funding stable for one year!" Braid exclaimed. "We will respect the Chaoulli Decision in Alberta"
Kenney cites this 2005 court decision which pushed the Quebec government to expand private health care when the public system failed to deliver care in a timely manner. The case is still cited by conservative lobbyists as a rationale for American-style care. While Kenney doesn't say good things about Quebec, he likes to cherrypick this court decision to show his commitment to private care. "We will replicate elements of the Saskatchewan Surgical Initiative"
While Kenney doesn't usually say good things about La Belle Province, he does like to point to the Land of the Living Skies. Kenney's demeanour brightens when talking about the Saskatchewan Surgical Initiative (SSI), a favourite of the Fraser Institute. The SSI was used to target surgery wait times, but was discontinued in 2014 because the government was unwilling to keep up with cost increases. "Our health care plan is validated by Dr. Brian Day of the Cambie Clinic"
Kenney plans to wage war on British Columbia as his first course of action, hoping to purloin some health care blueprints as part of the spoils. Kenney's policy platform is endorsed by Dr. Brian Day, whose Cambie Clinic has been mired in the courts as part of a legal war to defeat single-tier health care. Day's claims that patients have died waiting for public care have been disputed by families. British Columbia has led Canada in extra-billing practices, including an investigation that showed multiple examples of patients being forced to pay out of pocket. "We need to look at a two-tiered system"
This bit of honest didn't come from Kenney, but from UCP candidate Miranda Rosin. With Albertans heading to the polls on April 16, there's only one way to stop Jason Kenney's attacks on two-tiered health care: vote for Rachel Notley. Notley sees strong public health care as central to life in Alberta, not as a business opportunity for friends, donors and lobbyists. As part of her campaign, she has vowed to continue to invest in the public services Albertans need.